Boost Your PageRank Sky-High and Dramatically Increase Your Business With One Convenient, Easy-to-Use, Inexpensive Software Program. Put the Power of PR Ninja to Work for Your Online Business Today! We all know that one of the most important keys to success for an online business today is search engine ranking. Unfortunately, in today's highly competitive Internet marketplace earning a high search engine ranking has become more difficult than ever before. Are you just a little frustrated with your current search engine results? Have you had it with the flood of eBooks and 'gurus' trying to sell you on what worked last year? If you are sick and tired of wasting your time on slow, costly, ineffective methods that used to work, welcome to what works now... Welcome to PR Ninja! With PR Ninja you will cut your link campaign work hours drastically. In fact, you can find out everything you need to know to pull in massive traffic in mere seconds! and Watch Your Business Grow! Did you know that incoming links (also known as inbound links and non-reciprocal links) have gained unprecedented importance in how search engines rank websites? In fact, website optimization, no matter how well it is done, is no longer sufficient to obtain a high search engine ranking for your business. All of the major search engines, including Google, HotBot, All The Web, Lycos, AOL, Excite, GoEureka, IWon, Comet and Ask Jeeves, now factor in link popularity to determine site rank. The more high quality, relevant links that lead to your site, the higher you will rank. In short, developing and maintaining high quality links to your website is now essential to the success of your business! You need to find many relevant, high quality sites that may be interested in linking to your site. You need to e-mail the webmaster of each of these sites, requesting a link exchange. You need to keep your link pages updated with all of the latest links. Finally, you need make sure that each site you've exchanged links with continues to link back to your site - and if they don't, you have to let them know about it. PR Ninja takes all the hard work out of building your link network, so you have more time to concentrate on what you do best - which is run your business! As a webmaster, you've got more than enough work to do. So why spend even more time looking for link partners? Starting right now, YOU can find relevant, high quality sites for you to exchange links with! It's fast, it's easy, and most importantly, you'll be able to attract more customers and increase your sales. Search engines will see all of the new links pointing to your site from other quality, relevant sites and increase your rank. Note: Don't confuse PR Ninja with indiscriminate link farms and link exchange services, which swap links via a centralized Web site and which give you absolutely no advantage with the search engines. PR Ninja doesn't use a centralized link exchange system. The exchange is conducted directly between you and the partner site. Your Competitors at Their Own Game! Use PR Ninja to uncover the linking structures of your top competitors' websites. Then use this information to improve on what they are doing and ensure yourself a top search engine ranking! 1. Secretly Spies On Your Competition - "Keep your friends close and your enemies closer!" Ok, maybe that's a bit dramatic, but you get the idea. If you know which sites link to your competition you can ask them to link to you too. 2. Improves Your Search Engine Rankings - If you know how many sites are linking back to you now, you can increase your search engine rankings by simply contacting more high PageRank sites relevant to your site. 3. Increases your website traffic - As other sites that you contact begin to link to your site, you will generate additional targeted traffic to your site without spending a dime. And more traffic means more sales! 4. Tracks Your Linking Progress - If you have a starting point, you can track your results that much better. PR Ninja automatically tracks your campaigns and checks to make sure partner sites still link to you. 5. Advanced Sorting Capabilities - With the click of your mouse you can arrange the list by URL, PageRank, Results Position, Keyword, Links In, Links Out and Score. The default sort is from most to least PageRank. 6. Stores All Your Information - PR Ninja was designed as a time-saving tool. You can easily save your reports to your choice of folders or on a disk as CSV or HTML files. Pull them up whenever you want! 7. 100 complete satisfaction money back guarantee - You have absolutely nothing to risk with PR Ninja. If you are not satisfied for any reason, I will promptly refund your entire purchase price, no questions asked. As you can see, the benefits of PR Ninja are wide and diverse. I know this may sound kind of new to you, but I can assure you this simple piece of software will change your whole outlook on linking. To Increase the Popularity of Your Site! Go ahead and ask anybody who is knowledgeable about Search Engine Optimization and they will tell you that you need quality inbound links to obtain a high ranking. PR Ninja solves this problem by extensively searching the web and finding thousands of high PR sites relevant to your site. It even will provide you with the contact information so you can establish reciprocal link agreements with site webmasters. Growing your online business has never been this easy or convenient! You know that your most valuable asset is time. That's why you do everything you can to automate as many online tasks as possible. PR Ninja will save you huge amounts of time while helping you drive more and more targeted traffic to your site! If you continue to do what you have always done, where will you be 6 months months from now? Will it be enough? If not, make a change today. Use this simple software to propel your website to a new level. When you place your order right now, you will receive PR Ninja for a one-time fee of just $17. You can begin to use it immediately. No waiting, as it is a digital download and you can download it now. We are seriously committed to remaining on the cutting edge of ranking analysis software. Whenever a technological advancement is made that we can implement to improve PR Ninja's performance, we will do so quickly. By ordering now, you will guarantee that you receive all future program updates FREE of charge! Do you want to become a reseller/affiliate and get 50.0% provision? 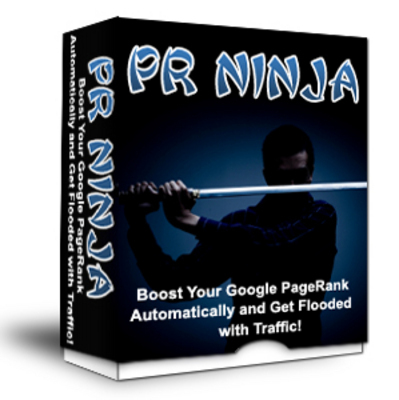 PR Ninja Pagerank Booster increase pagerank;keyword rank;pagerank software;pr ninja 87837957 21.00 mystore Fresh Download Available!